Last month, Scott re-imagined Cormac McCarthy's Blood Meridian as a videogame. The grotesque imagery and uncomfortable narrative style paint a bleak and appalling portrait of America's westward expansion, leaving the reader disturbed and uncomfortable. Let there be no doubt, this book is not an uplifting or fun read, but it is an invaluable and remarkable piece of literature every person interested in the Mythic West should peruse. Could a videogame even begin to tread on such dark subject matter? There are plenty of readers who cannot finish Blood Meridian, surely the completion rate of the videogame version would be much lower considering players expect games to be fun or entertaining experiences. How many times have you heard a reviewer decree the ultimate worth of a videogame depends on the answer to this question: "Is it fun?" As I have said once before, I believe the expressive power of videogames is limitless, but popular notions characterize videogames as inherently 'playful.' This 'imperative of fun' stifles creative content and must be subverted or coopted when designing a game that is not actually enjoyable in the traditional sense. Creating a game that is not fun might be a horrible design choice. Don't get me wrong, the 'fun factor' of a game is crucial when I assess a games worth, and I believe 'play' to be a completely legitimate endeavor for adults as well as children. But I can also appreciate a contemplative and depressing book or movie every now and then. Revolutionary Road, Requiem for a Dream, and Waltz with Bashir are all thoughtful films worthy of praise despite unsettling most viewers. How accurately can videogames invoke suburban malaise, irrational cruelty or oppressive tyranny? Can a videogame be less concerned with empowering a protagonist and depict instead their road to desperation and failure? There are, of course, games with disturbing content, but none as contemplative and unrelenting as some of the examples mentioned above. There are a few ways to get around a fun focused player. A narrative 'bait & switch' could make a player think they are in a jovial environment only to reveal the story is far more bleak. "Surprise! You're actually stuck in an insane asylum!" Braid's 'switcheroo' at the game's end is a great example of this tactic. One could also embed the story in a less depressing environment. Maybe the character is having a very bad dream in the middle of a traditional adventure. The achievement or trophy system may also serve to distract the player from a more disturbing experience by wrapping them in the comfort blanket of familiar goal accomplishments. "Achievement Unlocked: You Lost Your Family's Savings on a Horse Race." But do these insertions of fun sell the experience short? War games have managed to create fun experiences in decidedly not-fun environments. There is a distinct wall between the player and the sobering reality of war. A Gamasutra excerpt of Paraglyph Press' A Theory of Fun for Game Design suggests gamers see mathematical patterns in any given situation, health or experience point contributing to in-game success for example. "This is why gamers are dismissive of the ethical implications of games." Creating a game where the player should not or cannot dismiss the ethical implications is problematic. Players can separate a WWII game from its source material and designers help out by not including a holocaust survival mini-game. 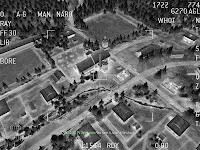 Call of Duty 4 breaks the player-experience divide by asking the player to partake in an all too real aerial bombing scenario midway through the game. The visuals in this segment, visible on the right, are disturbingly similar to computer guided missile systems commonly used in the military today. When playing this level, I was reminded how easily destruction is wrought by people who are encouraged to give their actions about as much thought as I was giving to killing combatants in videogames. Maybe this thought experience is self-defeating. Why should players finish a game that is not actually fun to play? At the very least a game's mechanics must be satisfying. If a game's mechanics can be enjoyable enough to encourage continued play, a game can potentially cover some very dark subject matter. Even heartbreaking movies can be beautifully composed. If there is a good story to tell, and it is told well, then perhaps there will be many who will gladly play tragic and unforgettable experience. Far Cry 2 does this pretty well, but the onus is on the player to stop and think about how absolutely monstrous their actions are. The game itself is satisfying, and deliberately so. But its material is extremely dark and when one thinks about exactly why it's satisfying, it only becomes darker. Unfortunately, many people just saw it as "another shooter" and saw the trees instead of the forest. I think Call of Duty is a great example here. Do you think this level was included intentionally to create exactly that kind of effects? I think the key to the whole problem is to clearly establish the roles for the players and motivate them. Motivation doesn't necessarily has to be fun, sometimes simply curiosity ("Oh gosh, how will this mess end?") can be enough. Krystian said: "I think Call of Duty is a great example here. Do you think this level was included intentionally to create exactly that kind of effects? While you weren't asking me, I do believe it was included intentionally. In the same way that I believe that other scenarios in the game were intentionally included, such as the nuclear explosion. While Call of Duty 4 was obviously still a gamer's game, I feel that there was an indirect message that Infinity Ward wanted to convey with it as well. No, it's not a message of their opinions on war but rather just the message of the reality of war. My statement seems contradictory when you consider how the game is played, but what I mean is that I think that IW were simply trying to convey just how serious war is and that while shooting people can be fun, there is much more to it than that. The opening scene is another one that comes to mind, actually. In response to the actual post, this is going to sound vague but all I will simply say is that if the content is there, the audience will come and your movie examples are proof of that. It seems to me that universal fun is a subjective, vague, intangible but that the 'type' of players themselves determine how enjoyment is manifested(See Little Big Planet). Perhaps it's the Ueda brain vs. the Jaffe popcorn(which most of the market appears to mirror). I would love to see what Cormac McCarthy could do with a video game, but a Blood Meridian game would be fun for me just to be in that world(Again, subjective and snowflake like), even perhaps with no story; Just a rich, complete world to walk around in. Far Cry 2 is definitely on my soon-to-play list. I'm with Steven on this one, I think that scene was completely intentional. The dialogue between the pilot and other combatants is particularly off the cuff and jovial, making the entire experience a little creepy. It's also counter intuitive for what you would think most players would want, namely a up-close, fast action extravaganza, not a slow, distant, black and white experience. I agree with your last point which gets me into Whiskeypail's comment as well. I love game exploration, so if a world is interesting enough I need very little other motives to progress. Maybe if a world is truly dark like Blood Meridian, I would continue poking around with a strange sense of awe and intrigue to see what other horrors the game contains. That being said, the atmosphere in Fallout 3 is already a little hard to keep me going, and not everyone is just happy exploring. To turn the post around on itself "How many games have you played through that weren't fun?" The later comments start to touch on it, but I certainly have played many, many games for far longer than they were "fun", if they were ever fun in the first place, in search of some deeper story or social experience. I'm perhaps an outlier in the vast number of games I can think of that I have played despite a lack of fun, but I think there is still a significant number of games out there that can be classified in the "wasn't fun, played it for x" buckets. I don't think there is an issue in getting players to play a dark game that isn't necessarily fun. I think if there is an issue the question is "who would build such a game right now?" and "who would pay for it?". Unfortunately, right now the audience may be as big in gaming as in literature for a work that you want to hate but need to finish, but it isn't a LCD audience that big publishers see any reason to target. Ya know, there were very few games I can think of that weren't fun that I finished. Part of it is a game is a mixture of mechanics and story. Some game mechanics can be weak but if a story is gripping I'll look over those flaws and consider it fun, perhaps because not ALL of those mechanics are terrible. If a game cannot be salvaged I'll just stop playing it. Like you, I have tendency to continue playing games that aren't fun to me. The problem is, it's hard to discuss such games without starting a flame war! @Scott - Is it possible, perhaps, that deep down our desires to be part of the conversation (as seen with the blogging/gaming community) or to be 'in' with everyone else one of the reasons you saw MGS 3 to the end? Do you think that the high praise the game got from both critics and 'normal' gamers alike, motivated you to continue on despite your lack of interest or do you think it was something else? I'm curious to know because lately I have been wondering if we are influenced by other people's opinions more than we'd realise. I'm certain the fact that everyone else seemed to be "in" on MGS3 led me to finish it. As I've said before, I'll also suffer through games if I feel they are important in the grand narrative of gaming. As far as my reaction to popular games: I also have a hard time separating the hive mind thinking from my own thoughts. Sometimes, I worry that I am being unduly harsh if I criticize a title most people seem to like. Great article. I am also a fan of some pretty dark and depressing films, like the ones you mentioned. It is actually a nice challenge to think of how you could create an introspective, serious, and gloomy game and still have mechanics that make it something you actually WANT to play. There are a few examples that hint at this possibility. Silent Hill 2- This game begins with a man finding the letter from his dead wife that gives him some sort of tragically misguided hope that they might reunite at their special place in Silent Hill and he will feel love again. The hell that awaits him there is nothing compared to the hell of his loss. He is broken and empty from the loss of his wife and has lost regard for his own safety as he plunges into the violent hordes of zombie-like creatures in an effort to feel whole again. Surprisingly, this game still works despite not even having fun mechanics- the play control is pretty horrible and clunky, but you still want to come back to it to further understand your character's pain. The bad play control even kind of worked because it made you feel more hopeless. It's like a toothache- it hurts every time you touch it, but you keep wiggling the tooth just to see if it still hurt as bad as it did 10 seconds ago. I also think Shadow of the Colossus did a wonderful job of making you feel completely isolated and lonely in it's barren world. It's also one of the only games where I actually felt sad for slaying some of the majestic creatures that made up the boss battles. It doesn't necessarily have a very happy ending either. I actually hope to see more games like these that go for a more uneasy, unsettling vibe. Not necessarily dark from hideous violence, but just capturing that intangible feeling of being alone and broken. Thanks for the compliment. The examples you mention are fantastic, especially Silent Hill 2. I think Horror is a genre open for some of those heavier themes because players can feel as if they are vanquishing incarnated forms of the more disturbing themes, even if that is accomplishing nothing.